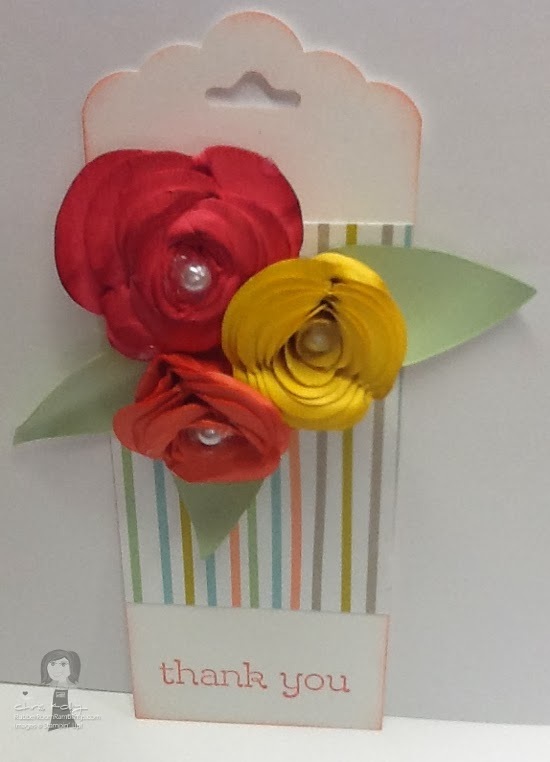 SCALLOPED TAG TOPPER PUNCH CELEBRATES WITH THE SPIRAL FLOWER ORIGINALS DIE! I love so many of the new products in the Occasions Mini Catalog, and here are two of my favorites. "That Michelle" and I made this beautiful tag. 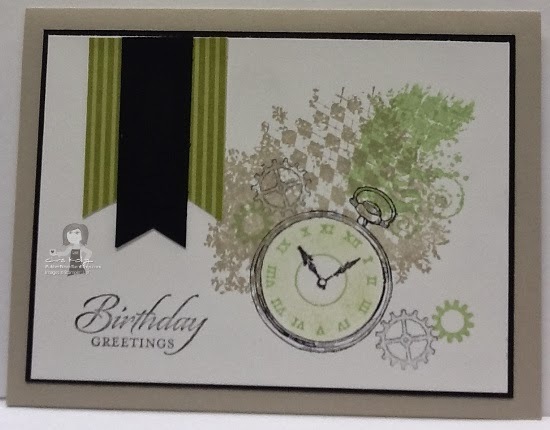 We used lots of new products from the Occasions Mini Catalog, including the Scalloped Tag Topper Punch, the Spiral Flower Originals Die, and the sentiment from the Happy Watercolor Stamp Set. 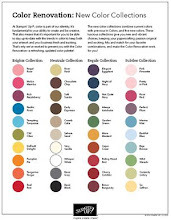 Then we added some Sweet Sorbet FREE Designer Series Paper available in the Sale-A-Bration Brochure. 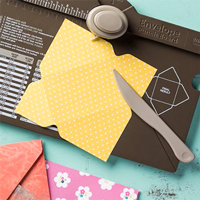 When you order the Scalloped Tag Topper Punch and the Happy Watercolor Stamp Set, you can get FREE Designed Series Paper too! ORDER YOUR OCCASIONS CATALOG ITEMS HERE! "That Michelle" strikes again! This is a card Michelle shared with me, and I LOVE IT! Who can resist such an adorable robot AND chocolate at the same time? This card has it all for me! I have been seriously missing my play time with "That Michelle", and finally, today, we were able to get together again. AND she is still just as talented and "over the top" as always. Truly love what she does!! This is such a beautiful little heart candy holder. The roses were "just scallop circles". I don't about anyone else, but when I punch a scallop circle, it does not come close to resembling these beautiful flowers. Thank you so very much, Michelle, I love it!! WOW! Today is a really big day at Stampin' Up! and I have lots to share with you! Sale-A-Bration begins today, and you can find a post HERE with all the details of Sale-A-Bration. It is Tuesday, and that means there are more great Weekly Deals. You can find this weeks Weekly Deals HERE! And Stampin' Up! also announced two awesome new products! Both of these items will be available in the upcoming Stampin' Up! Annual Catalog, and you are getting a little opportunity to experience how wonderful they are now. These items are the Texture Boutique and the Hip Hip Hooray Card Kit. You can read all about these great products in the posts below. I want to point out to you, though, that when you purchase either or both of these great items, that/those purchase(s) will count towards your minimum $50 purchase necessary to receive a FREE Sale-A-Bration item. For instance, if you were to order the Texture Boutique for $29.95 and the Hip Hip Hooray Card Kit for $19.95 you could order the Flower Graden Textured Impressionals Embossing Folder, which is on sale this week for only $5.96 AND pick one item from the Sale-A-Bration catalog for FREE. There are so many great deals going on right now, you won't want to miss any of them! 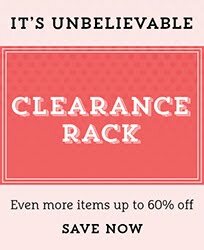 Check out all of the details in the Rubber Room posts below and then have fun shopping and saving! A BRAND NEW EXCITING CARD KIT IS NOW AVAILABLE! In addition to this being an awesome deal for only $19.95, remember this purchase will count towards a minimum order for Sale-A-Bration and FREE items! ORDER YOUR HIP HIP HOORAY CARD KIT HERE! This machine makes embossing super-duper easy~~and transportable! Last year Stampin’ Up! introduced a machine just for embossing, and now it is back. There is a limited number available at this point, but this product will be offered in the upcoming Annual Catalog. This is a great little machine if you want to enjoy the fun of embossing without purchasing the the Big Shot. The Texture Boutique is smaller and easier to carry than the Big Shot. AND the Texture Boutique is cheaper too~~it is only $29.95! 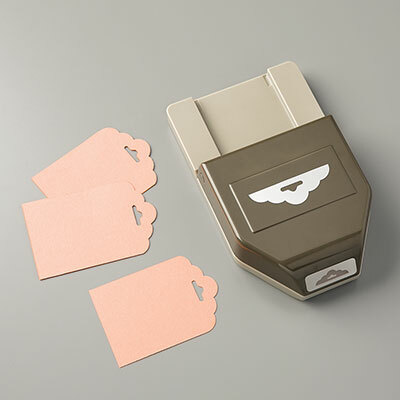 This handy little machine works with the Textured Impressions™ Embossing Folders and can be used with ordinary cardstock, paper, metallic foil, or vellum. When ordering your Texture Boutique, don’t forget to order the new Textured Impressions Embossing Folders in the Occasions Catalog. When your order reaches $50, be sure to add the Decorative Dots Textured Impressions Embossing Folder in the Sale-A-Bration catalog for FREE! ORDER YOUR TEXTURED EMBOSSING FOLDER HERE! Look at what is on sale this week! 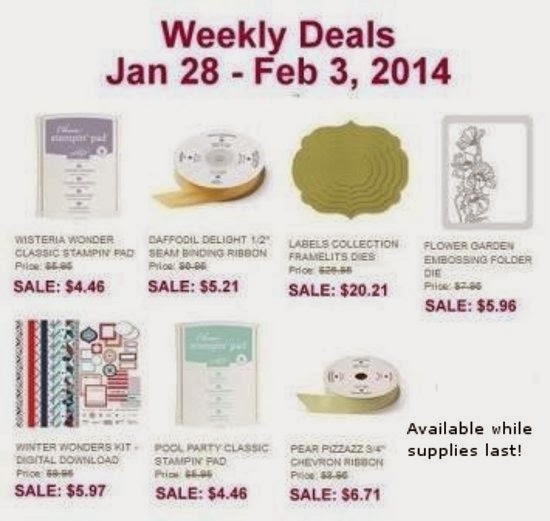 The weekly deals offered by Stampin' Up! are a great way to save some of your hard-earned dollars. AND during Sale-A-Bration your order will count towards your FREE Sale-a-Bration bonuses! It is definitely a win-win for you from Stampin' Up! 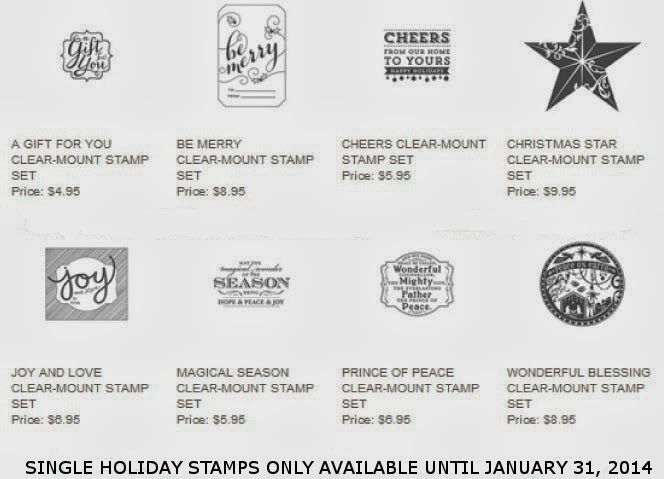 The single holiday stamps will not be available after January 31, 2014. Be sure to order them before they disappear. ORDER YOUR SINGLE HOLIDAY STAMPS HERE! Sometimes it is very difficult for me to come up with a masculine card. I think this happens for a lot of reasons, but most specifically for the big reason that I love flowers, butterflies and ribbon~~none of which are masculine! Having said that, however, I will confess to having two favorite stamp sets that make it super-duper easy to whip up a masculine card. One of the stamp sets is Clockworks and the other one is Wetlands. For this card, I have combined one of the sentiments from Wetlands with the Clockworks Stamp Set. I think the color combination of Old Olive, Sahara Sand, Basic Gray and Black lends an even more masculine feel to this card. AND even better is that the sentiment on this card can easily be changed, and the card can be used for many different occasions. This stamp set also works with four different circle punches to make assembly extra easy. ORDER YOUR CLOCKWORKS STAMP SET HERE! I love Sale-A-Bration, and I think Stampin' Up! makes it even better every year. This year is certainly no exception! Sale-A-Bration begins January 28, 2004, and, as always, it has something for everyone. For the shopper, you will get to pick on exclusive SAB product for every $50 order you place. If being the hostess is your thing, you will receive an additional $30 in hostess dollars for a qualifying party. Or, if you want to take the plunge and enjoy the many tremendous benefits of being a Stampin' Up! Demonstrator, you will receive $150 work of products in your Starter Kit for just $99. Which one of these best describes you? Pick one and get ready to enjoy SAB!! Sadly, I am way behind in sharing stuff with you. I have lots of goodies stacked up and ready to share, so here we go! This is a card Keri shared at one of our Demo Diva get togethers before the holidays. I know, SERIOUSLY, way behind in sharing! For this awesome file-folder card, Keri used the Envelope Punch Board, and that was the turning point for me. Right then I knew I NEEDED the Envelope Punch Board. 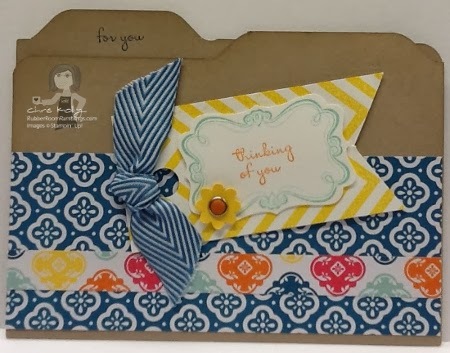 Keri's file-folder card uses a lot of wonderful goodies besides the Envelope Punch Board. Here is a little list for you: Quatrefancy Specialty DSP; Brights Assortment of Candy Dots; Itty Bitty Shapes Punch Pack; Island Indigo Chevron Ribbon and the Sweetly Framed Stamp Set (which is an exclusive hostess stamp set). Thanks for sharing, Keri! ORDER 24/7 FROM MY ONLINE STORE! SCHEDULE A WORKSHOP HERE TO EARN THE SWEETLY FRAMED STAMP SET! Stampin' Up! held their Leadership Convention last week in Texas, and they made lots of announcements, that I want to share with you. Check out the posts below and see all the awesome news! STAMPIN' UP! "INSPIRE, CREATE,SHARE" CONVENTION FREE! Attend the Stampin' Up! 2014 Inspire. Create. Share. Convention FREE! Anyone who joins or has joined Stampin' Up! as a demonstrator from July 1st last year through Stampin' Up! 's upcoming convention registration dates in 2014 (usually in April) can attend the "Inspire. Create. Share" Convention for FREE! 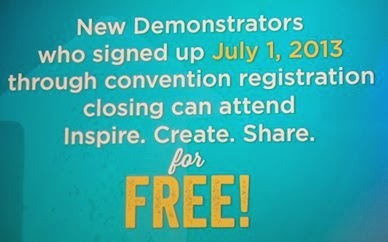 I will update you with more details when they are available, until then, though, I encourage you to think about becoming a demonstrator and joining me at convention in Utah this summer! One of the best times to join Stampin' Up! is during Sale-A-Bration. January 28 through March 31st. During Sale-A-Bration the Stampin' Up! starter kit (completely customizable and always only $99) is an extra-special deal. 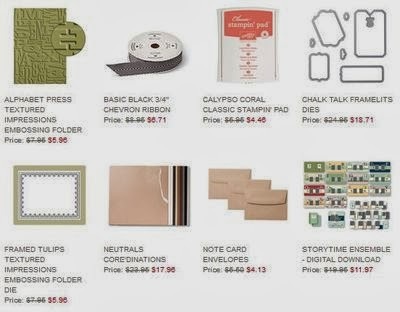 Instead of choosing $125 worth of Stampin' Up!, products, you can choose $150 worth of Stampin' Up! products for only $99. With these goodies sending your Valentine treats and greetings could not be any easier! 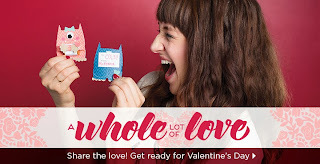 ORDER YOUR WHOLE LOT OF LOVE PRODUCTS HERE!